Nevertheless the movie has received much acclaim. It has won prizes at the Cannes Film Festival, The London Film Festival and from the American Film Institute. I wonder how these hearing people that are applauding The Tribe as a cinema masterpiece would react if they had to watch movies without knowing what the characters were talking about everyday. I am sure the novelty would wear off very quickly. Deaf people that attended the movie were interviewed as part of an ABC TV story. They all seemed to enjoy the movie. Interestingly Debs took the opportunity to raise the issue of cinema access for people who are deaf. This was canny of him. Canny because it was an opportunity for hearing people to empathise with how people who are deaf are expected to access the cinema almost everyday and compare it with their experience of watching The Tribe. Debs took the opportunity to highlight the issues of the awful Captiview device such as eye strain, headaches and constant device failures. Debs disparagingly labelled Captiview with the term Craptiview. This is, of course, the none to complimentary label that the deaf community have given Captiview. The ABC showed this story on Lateline. They tried to interview the cinemas responsible for the introduction of Captiview. Only one cinema franchise would respond, this was Village Cinemas. Village proudly proclaimed that they provide five devices per screen and an open captioned session once a month. Looking at the Village movie schedules in Melbourne there are movies that are closed captioned in the next few days including Saturday and Sunday. However, most cinemas only have one or two movies captioned. The choice is extremely limited. Certainly there would appear to be virtually hundreds of Captiview devices just gathering cobwebs, especially if there are five per screen. Sadly, there appear to be no open captioned sessions at all, which is what people who are deaf prefer. In total there are five devices per screen in a cinema complex. This means, if Village are to be believed, that every screen has the ability to provide closed captions, even if it is through Craptiview. 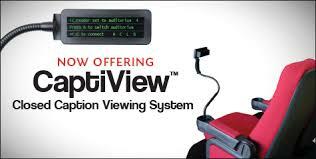 In the next three days there are 10 movies with closed captions sessions through Captiview. Of all the mainstream movies on show only one, Tomorrowland, does not appear to have any captioned sessions. This means ALL the movies except Tomorrowland have closed captioned files. There are some foreign movies with subtitles. On the surface it looks like there is a fair bit of choice for people who are deaf if they want to risk the perils of Captiview. I can see the pro-Captiview people sitting up haughtily and saying – “SEE I TOLD YOU SO” But consider this – Every movie on show at Village at the moment, bar one, has a closed caption file. This means that if the cinemas care enough all they have to do when they get the movies from the distributor is request the closed caption file. Once they have this file they simply need to ensure it switched on at the start of the movie. This means, potentially at least, that almost every session – AND I MEAN ALMOST EVERY SESSION – potentially can be captioned. Village cinemas can provide full access from the moment they open until the moment they close. But they don’t! And it costs them nothing because the closed caption files are part of the cost for hiring the movies that the cinemas show. Most Village cinemas are showing the same movies. For example they have popular blockbusters like Mad Max, Entourage, The Avengers, San Andreas, Spy, Aloha and so on. All of these movies have a closed caption file and are being shown at various locations across Melbourne. At Airport West, which is a Village franchise, They are showing Mad Max, Entourage, Aloha, San Andreas and several other movies that are being shown with closed captions at other locations. Yet Airport West are only showing Entourage with captions and nothing else. Why are they doing this when clearly there are caption files for all the movies they are showing? It is a similar story at other locations although some are showing more than one movie with closed captions. The most would be three movies at any one time. Yes, most people who are deaf hate Captiview but this is besides the point. The point is that the cinemas, not just Village, are treating patrons who are deaf with absolute contempt. They have the capacity to deliver closed captions to every session. It will cost them nothing and all they have to do is switch on the captions at the start of the movie. Not only do we deafies have to put up with a device that is a health hazard but we are having our choices limited by mega rich cinema franchises that have the capacity to deliver captioning for virtually every single movie at NO EXTRA cost! Our advocates who sold us up the creek with this device when we were clearly being screwed also have a lot to answer. They with their playing of politics and fancy semantics have a lot to answer for. We cannot turn back the clock, whats done is done. But surely we should not stand for being treated in this way. The cinemas simply do not care. It is a disgrace! Those hearing people who are enjoying The Tribe so much, enjoy it while you can. Enjoy it with the thought that it is probably he only movie you will ever watch where you do not fully comprehend what is going on on screen. Just thank your lucky stars you are not treated like dirt which is how the Big 4 cinema franchises treat deaf people!! The way they treat patrons who are deaf is the definition of contempt.